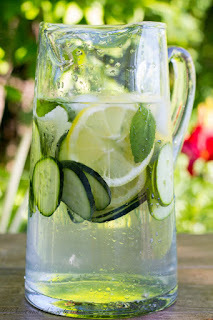 mobileWOMEN.org: Beat the Heat with Naturally Flavored Water! Beat the Heat with Naturally Flavored Water! “Record-breaking heat!” “First alert weather.” “Heat advisory.” “Scorching temperatures!” It seems that, for much of the nation, these have been common phrases used to describe recent weather. For many of us who are sitting, this means overheating (due to an inability to sweat), dehydration (which can lead to constipation) and edema. Edema is swelling caused by excess fluid trapped in your body's tissues. Although it can affect any part of your body, edema is most commonly noticed in the hands, ankles, legs and feet. We all know that the number one, most important action during these hot times is to drink plenty of water. This can get old after a while, though, and not everyone loves drinking water. Often they turn to soda, iced tea and other sugary, caloric drinks which are neither hydrating nor healthy. Some choose diet soda, but it has actually been linked to weight gain and high blood pressure. Fruit juice is a healthier option, but is still high in sugar, carbs and calorie content. So what is the solution? 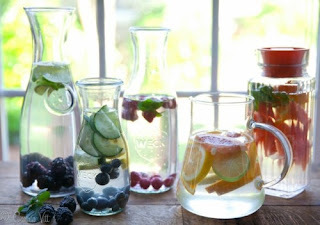 Try naturally flavored waters infused with fresh fruit and/or herbs (often served in spas). 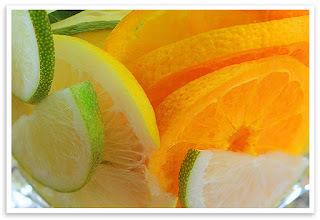 It’s simple, delicious, refreshing, nutritious, easy to make and inexpensive! Many are loaded with antioxidants and, depending on the ingredients, can be a natural diuretic to help to relieve the symptoms of edema. An added bonus is that they just are visually beautiful and will impress your guests. What more could we ask?! Slice fruit into rounds, then cut the rounds in half. Add to jar, press and twist with a muddler or the handle of a wooden spoon. Press enough to release some of the juices, but don't pulverize the fruit into pieces. Fill the jar with ice. Pour in water to the top. Stir it. Put a lid on it, put it in the fridge, and chill. Wait at least an hour for the flavors to mix but tastes even better the next day! You can add water as you go along but the flavor will not be as intense. Finely slice the cucumber, leaving the skin on. Add cucumber and basil to the jar and press with wooden spoon or muddler. Add ice and water, then stir. Place lid on container and refrigerate. Note: Cucumber is a natural diuretic and will help relieve edema. Watermelon, another natural diuretic, can also be added. Don't be restricted by these combinations. The possibilities are endless, so feel free to experiment with your favorites. Have a spa day at home, put your feet up and chill!